The Native American calendar names each month’s full moon according to natural events. The Beaver Moon occurs in November and signifies a time of hunting and gathering in preparation for winter. 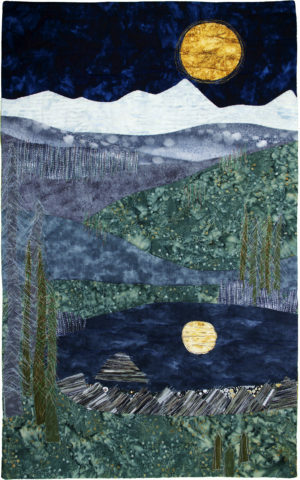 This quilt attempts to show the contrast of warm earth and cool air which cause mist and fog to cover the land, along with beaver activity along their pond. Vikki Pignatelli’s “Improvisational Curves” techniques; reverse applique, original rusted; raw-edged applique and machine quilting; Lonni Rossi’s mitered facing technique. Commercial fabrics; rusted muslin; rayon, cotton, and monofilament threads.